Dill is, we think, one of the great herbs, and is sadly underappreciated and underused in the U.S. Dill is grown for both its dried seeds and its ferny leaf; though the same plant can be used for both purposes, cultivars aimed at one or the other particular use have been bred, so one is best off using different plants, of different cultivars, for the two purposes. This page deals only with growing dill for seed. Though there is no unequivocal trend to any one cultivar, the kind Bouquet seems to be the dill-seed (as opposed to leaf/fern dill) standard, and is the easy choice. Dill is in commercial field production in the Canadian prairies, so we should have no trouble growing it hereabouts. The usual advice is “spring”, sometimes given as “April”. But because we want the soil already warm when we plant out, around here early to middle May might work best. Direct-seed dill where you want it to grow. 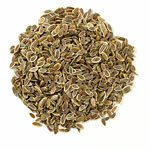 Plant dill seed very shallow, or put it on the surface and sift a little sand or fine soil over it. Water well. Be patient: dill seed can take up to 25 days to germinate, though it is more like 2 weeks when the soil is satisfactorily warm at planting time. When dill plants first flower, they will benefit from a light sprinkling of a fertilizer high in potassium and phosphorus. Plants are typically cut for harvest when they reach about 12 inches in height. Hang cut plants to dry over a catch-cloth; when they are thoroughly dry (and the seed has turned from green to brown), dump them into a holding bag (which you will later use for threshing them). When your seeeds are thoroughly dried, thresh the lot: beat the holding bag in which you have collected them against a hard surface to dislodge the seeds. Sift the loose seeds through a 3-inch mesh hardware cloth to remove the chaff. Make absolutely, positively sure the seeds are thoroughly dried before putting them away for storage (in the usual manner for dried herbs and spices: an airtight container stored in a dark place, preferably a cool one). It is said to be a common practice is to “barber” dill seeds to remove the hair-like strand or whisker found at one end, but in just what this “barbering” consists is not stated in any source we saw. It was last modified on Monday, 4 February 2019, at 02:50 EST.